The 2016 USDA farm income forecast shows that USDA expects direct government program payments to increase by roughly $2 billion over 2015 levels, reaching a total of $12.8 billion. The increase was driven primarily by increases in payments under the ARC and PLC programs. From 2015 to 2016 the forecast is for PLC program payments to increase from $754 million in to $1.96 billion (160% increase) and payments under ARC programs to increase from $4.38 billion to $5.94 billion (35% increase). These payments provided some cushion to the downward trend in farm incomes, but also indicate that government payments are becoming a larger share of net farm income. Given the 2016 forecast of net farm income at $66.9 billion, direct government payments account for 19% of net farm income, the highest proportion since 2009. Payments under the various ARC programs, but primarily the ARC-CO program, are now the largest category of direct government program payments. The next largest payment categories are conservation payments and PLC payments. The ARC-CO program is clearly an important factor in determining the amount of total government program support to the agricultural sector. As we pointed out in a post last year, the design of the ARC-CO program is such that the benchmark price guarantees will begin to fall when commodity prices undergo a multi-year period of declining prices such as occurring. Below we will recreate the two key tables from that post with updated values. Where Do We Stand on Benchmark Prices? Table 1 shows the MYA prices used in the calculations for corn, soybeans, and wheat from 2009 to 2015. The MYA prices have been adjusted to replace values below the reference price with the PLC reference price (marked with an asterisk). This was the case in 2009, 2014, and 2015 for corn and in 2009 and 2015 for wheat. Soybeans have yet to have a year in which the market year average price falls below the reference price of $8.40 per bushel. The prices in Table 1 can be used to calculate the ARC-CO benchmark prices for the years up to 2016. The benchmark price is the Olympic average of the previous five years of prices for a given commodity. The Olympic average is calculated by removing the high and low prices from the calculation of the average. Thus, the average is calculated from three prices. The calculations of the Olympic average prices for each commodity are shown in Table 2. 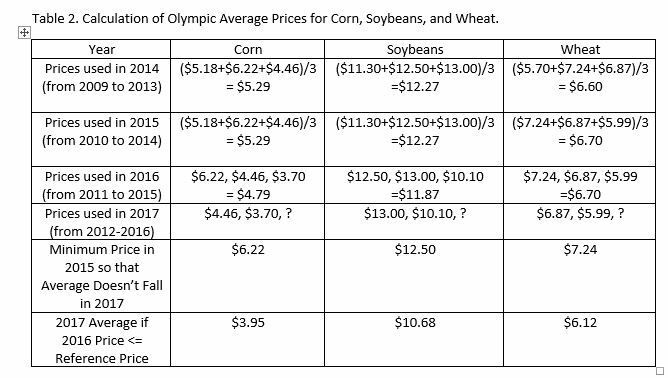 For both corn and soybeans, the Olympic average prices started their decline in 2016. Corn fell by $0.50 per bushel and soybeans fell by $0.40 per bushel. Wheat on the other hand remained at $6.70 in 2016 (all shown in the third row of the table). In the case of corn and soybeans, the declines occurred because the 2010 prices which were included in the 2015 average are no longer available and the prices replacing them were considerably lower. Specifically, for corn this meant trading the 2010 price of $5.18 per bushel for a $3.70 price. In the case of soybeans, the 2010 price of $11.30 was swapped for $10.10. While it is not possible to calculate the exact prices for 2017 because we don’t know the 2016 prices yet, we can get a good idea of where the Olympic averages are likely headed. Heading into 2017 it appears highly likely that the averages will again decline. The third row of Table 2 shows the prices that are included in the calculation of the 2016 benchmark prices. For all commodities, the 2011 prices were included in the calculation of the guarantees and are no longer available in 2017. In other words, all commodities are set to lose another high price from the calculation of their averages. However, it is possible that if the 2016 market year average prices were high enough then the Olympic average would not fall. The second to last row of the table shows the minimum 2016 market year average required to keep the benchmark price guarantee from falling. As you can see these prices are quite high. For corn, the 2016 market year average price would have to exceed $6.22 to avoid falling. While possible, it currently seems quite unlikely that such a price rise would occur. At present, the mid-point of the USDA forecast of the farm level price for corn is 3.30, wheat is 3.70, and soybeans is 9.20. The final row of the table shows the price guarantees were the 2016 MYA prices to come in at or below the reference price. For corn, the price guarantee would decline by $0.84 from 2016 to 2017. For wheat, the decline would be $1.12 per bushel. If soybeans were to finish at the USDA estimated mid-point of 9.90, the Olympic average would decline by 1.10 to 10.77. These declines are substantial and have the potential to cause significant reductions in ARC-CO payments for the 2017 crop. The ARC-CO program was designed so that the revenue guarantees changed with market prices and yields. Because prices have been trending sharply downward, the price guarantees are starting to work sharply lower. For the case of corn, the initial benchmark guarantee was $5.29. By 2016, it had fallen to $4.79. Unless the 2016 market year average price exceeds $3.70 per bushel it will fall to $3.95 per bushel for 2017. This is $1.34 lower than when the program started and will make it much harder to see large government program payments for the crop harvested in 2017 (payments to be received in 2018). There are several important things to note. This discussion has focused solely on market prices, and yields also play a role in ARC-CO payments. The last few years of outstanding yields have caused many of us to forget that because ARC is a revenue program it also provides protection for the case that yields fall. While price guarantees have been falling, the large crop yields of the last few years mean that it is likely the Olympic average yields are starting to rise for many counties. This provides a sliver of positive news. It is key to understand that the large ARC payments for the 2015 (and likely the 2016) crops should not impact 2017 cash rental decisions. Budgeting large (similar to 2015 and 2016) ARC-CO payments for the 2017 crop (which won’t be received until 2018) would seem to be a risky bet at this point. Further, one should note that normal planting decisions do not impact the payments. In other words, base acres, not whether farmers plant corn, soybeans or wheat in 2017, determine payments. Government program payments have played a key role in stabilizing farm incomes in economic downturns. Today, payments are again approaching 20% of net farm income at the sector level. Given the structure of the farm program it is likely that those in the ARC-CO program will start to see the level of income support decline in coming years. On the other hand, if low prices persist, farmers that chose to sign up for PLC, particularly in a commodity like wheat, may continue to see large program payments.